Police have announced a quick arrest in the murder of a 53 year old minimart owner and the shooting of his wife in the area of Wat Phai Rong Wua in Suphanburi on Friday. Apprehended on a warrant in Thong Pha Phoom district of Kanchanaburi was 32 year old Wirat “Petch” Meenut. Police found there were a string of other warrants in many districts out for the shooter, reported Daily News. Taken into evidence was a gun, bullets, a gold necklace and a gold amulet. 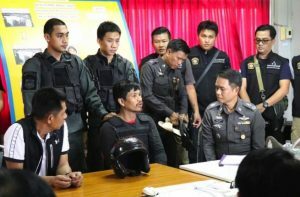 Wirat had accosted the owner of the Berm Minimart on the Song Phee Nong to Lat Bua Luang Road at 8.53 on Friday morning. Jamrat Mekmork was shot twice in the head and died later from his injuries. His wife was shot in the right shoulder and survived. 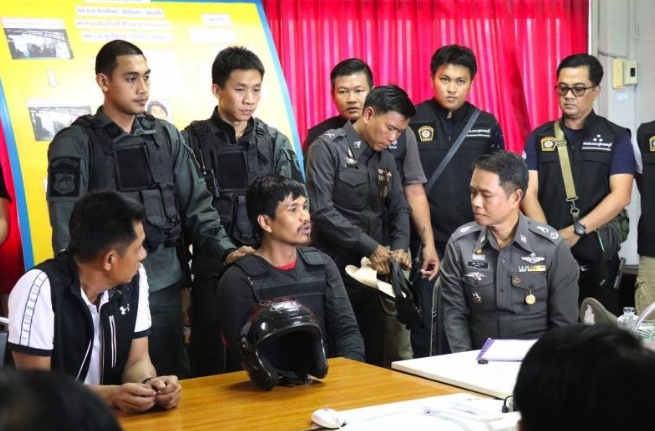 The robber made off on a motorcycle with the one baht weight gold necklace and amulet. Yesterday Wirat was charged with murder in the course of committing robbery. He was escorted on a reenactment of the crime by 100 police and soldiers. Three hundred relatives and locals turned out, many shouting abuse at the accused man.